I've got an openVPN client connected to an openVPN server with a particular set of routing tables. 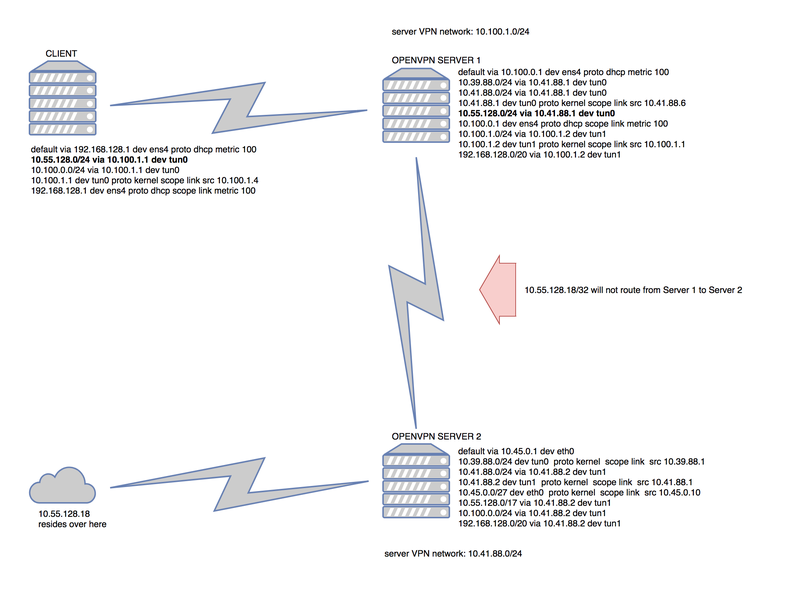 That openVPN server is also a client connected to another openVPN server with a different set of routing tables. I am having trouble getting my client to route a particular subnet to the second openVPN server. # push 10.45.0.0 route to all connecting clients. Iptables are clean on all three boxes as of right now. I am trying to ping 10.55.128.18 from the client and have it route all the way to Server 2. It makes its way to Server 1 and won't route to Server 2. I can ping 10.55.128.18 directly on Server 1 (not from the client). I've got IP forwarding enabled everywhere and firewall rules are open for ICMP between all three devices. Anything insight you can provide would be very helpful! I've got this resolved. There were additional routes that needed to be added (VPN routes that did not exist), as well a mis-configured iroute in the ccd directory for that connection.